Stephentown was first settled around 1765. The town was formed in 1788, from the East Manor of Rensselaerwyck District. The Stephentown pioneers were from New England, primarily Rhode Island and Connecticut. According to the United States Census Bureau, the town has a total area of 58.1 square miles (150 km2), of which, 58.0 square miles (150 km2) of it is land and 0.1 square miles (0.26 km2) of it (0.16%) is water. The south town line is the border with Columbia County, New York, and the east town line is the border of Massachusetts. 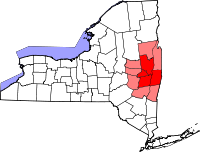 The western and central portions of the town are part of the Rensselaer Plateau. As of the census of 2010, there were 2,903 people, 1,141 households, and 838 families residing in the town. The population density was 49.8 people per square mile (19.1/km²). There were 1,339 housing units at an average density of 23.1 per square mile (8.9/km²). The racial makeup of the town was 96.7% White, 0.31% African American, 0.21% Native American, 0.14% Asian, 0.07% Pacific Islander, and 0.77% from two or more races. Hispanic or Latino of any race were 3.11% of the population. There were 1,141 households out of which 35.5% had children under the age of 18 living with them, 59.5% were married couples living together, 8.2% had a female householder with no husband present, and 27.2% were non-families. 21.0% of all households were made up of individuals and 7.2% had someone living alone who was 65 years of age or older. The average household size was 2.54 and the average family size was 2.94. In the town, the population was spread out with 25.7% under the age of 18, 6.8% from 18 to 24, 31.1% from 25 to 44, 26.1% from 45 to 64, and 10.4% who were 65 years of age or older. The median age was 38 years. For every 100 females, there were 96.0 males. For every 100 females age 18 and over, there were 99.3 males. The median income for a household in the town was $59,769, and the median income for a family was $61,347. Males had a median income of $31,535 versus $26,611 for females. The per capita income for the town was $25,352. About 5.7% of families and 6.6% of the population were below the poverty line, including 9.0% of those under age 18 and 7.0% of those age 65 or over. Cherry Plain State Park – Only a small south section of the state park is in the north part of the town. East Nassau – The east part of the Village of East Nassau is located at the western town line. Garfield – A hamlet southwest of Stephentown village. North Stephentown – A hamlet near the north town line on Route 22. Stephentown – The hamlet of Stephentown is in the eastern part of the town. Stephentown Flats – A former community south of Stephentown village. West Stephentown – A hamlet near the west town line. Wyomanock – A hamlet south of Stephentown village on Route 22. Pursuant to Section 68 of the Public Service Law, Stephentown Regulating Services LLC (SRS) (now operating as Stephentown Spindle LLC (SS)) was granted a Certificate of Public Convenience and Necessity for a 20-megawatt (MW) flywheel-based energy storage facility in 2009. It went in-service in 2010. There are 200 flywheels set within 20 pods on 5-acres that spin at high rates of speed (8,000 rpm to 16,000 rpm) storing energy as rotational energy. Each flywheel weighs 5 tons. The flywheels are energized by and discharge their energy into the New York State transmission system. The project was initially financed in 2010 with a $43 million loan from the federal Department of Energy, however, this amount was reduced to $25 million in 2012 when SS acquired the SRS assets. The company does not sell energy into the NYISO's electric wholesale market or capacity market, however, it does receive revenue from the ancillary services market for providing frequency regulation service. The stakeholder-driven policy at the NYISO excludes the facility from providing power into the NYISO's wholesale electric and capacity markets because it does not meet minimum criteria - a minimum of 5 minutes or 1 hour - for sustained energy delivery. The regulation service market in the NYISO provides revenue via two streams, a main regulation capacity price ($/MWh over a five-minute interval in the real-time market) based on a day-ahead and real-time market price, and a movement (performance) award ($/MW). For example, if the facility were able to provide its 20 MW output for 12 hours of the day at an average regulation price of $11 per MWh the facility would receive $963,600 a year. Revenue received from the performance fee, which averaged about $2.30 per MW in Q2 of 2018, is a much smaller proportion of annual revenue. It is the first commercial flywheel project in the United States to provide frequency regulation service. The only other comparable utility-scale energy storage facilities in New York are NYPA's 1,100 MW pumped storage facility at Blenheim-Gilboa and NYPA's 240 MW Lewiston pumped storage facility at Niagara Falls. For a power comparison, the capital region's peak summer demand was 2,032 MW in 2017. ^ Laws of the State of New York. State of New York. 1788. p. 757. Retrieved 2009-08-31. ^ "Rensselaer Plateau Association - Maps". Archived from the original on December 24, 2013. Retrieved August 26, 2013. ^ "Order Granting a Certificate of Public Convenience and Necessity, Approving Financing and, Providing for Lightened Regulation (case no. 09-E-0628)". dps.ny.gov. October 16, 2009. pp. 1–4, 16–28. Retrieved November 26, 2018. ^ "Rockland Capital Stephentown Spindle Website". www.rocklandcapital.com. Retrieved November 26, 2018. ^ Andy Colthorpe (May 8, 2018). "Convergent buys up 40MW of flywheels in New York and Pennsylvania". www.energy-storage.news. Retrieved November 26, 2018. ^ Joe Desposito (August 2, 2011). "Flywheels Land in Stephentown, New York". www.electricdesign.com. Retrieved November 26, 2018. ^ "NYISO Tariff Viewer Website". www.nyiso.com. Retrieved November 27, 2018. ^ "US Dept. of Energy Stephentown Spindle Website". www.energy.gov. Retrieved November 26, 2018. ^ a b "NYISO 2018 Gold Book" (PDF). www.nyiso.com. April 2018. pp. 14, 57, 58, 64. Retrieved November 26, 2018. Wikimedia Commons has media related to Stephentown, New York. This page was last edited on 27 November 2018, at 16:28 (UTC).